My babies had, by far, the smoothest little bottoms you ever saw in your life. But I digress. Today I want to talk about something called finesse. Webster defines it as "a subtle, skillful strategic maneuver”, and boy do I ever have the perfect illustration for it! It all started back in 1976 when our first child was born. Well, actually the real story began a few thousand years earlier, or however long ago it was that women began hanging their clothes out to dry on a clothesline. If you’re like me, you probably have some warm, sweet memories of this particular little domestic practice, and while all of us would agree that nothing compares with sleeping on sheets that spent the better part of a morning flapping in the fresh spring breeze, I’m also pretty certain that given a choice – warm sweet memories notwithstanding – most of us would opt for our Whirlpools over a clothesline any day of the week. Notice I said most of us. That’s because there is always one oddball in every bunch who totally goes against conventional wisdom, and in this case the oddball’s name is Marc Lewis, my husband. Born and raised on the dry, arid outskirts of Midland, Texas he is a true flatland farm boy – hard-working, straight-shooting, and annoyingly sensible. Not surprisingly then, when we had our first baby and I wanted to purchase a washer and dryer, his response was, "My mother never had a dryer the whole time I was growing up. If a clothesline was good enough for her, it ought to be good enough for us.” End of discussion. It is of note here that my baby wore cloth diapers, not only because they were cheaper, but because back then disposables were about as form-fitting as a wad of paper towels strapped on with some masking tape (and not nearly as absorbent!) Furthermore, because there was no such thing as a "diaper service” in our small town, I was consigned to dunking soiled diapers up and down in the toilet to remove the – well, you know – before dropping them into a diaper pail to soak. 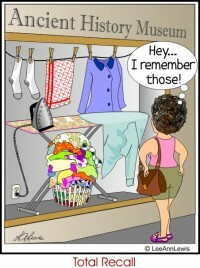 Then after washing a load in the washer I would hang them out to dry on the clothesline. Honestly I didn’t mind the chore all that much. The only time I had a problem with it was when there was a good old-fashioned west Texas sandstorm approaching, because if the sand got to my laundry on the line before I did, everything would be embedded with reddish grit – hence my opening comment about how smooth my babies’ bottoms were. It was the "end” result of wearing all those sandpaper diapers! At first there was just a very, very long silence. Then he said, rather meekly: "Okay, I get it. I’ll pick you up after work and we’ll go look at dryers.” Score one for "subtle, skillful strategic maneuvering”. Search for Chores articles similar to "A Clothesline in the Sand. Search all articles similar to "A Clothesline in the Sand".